Ellen Noble is the 2017 U.S. Cyclocross National Champion, the current Pan- American Champion and the Women's U23 World Cup series leader. Ellen is using the KICKR Power Trainer this season for warm- ups, cool- downs and indoor training. She is currently enrolled in school while managing a full time race schedule both in the U.S. and in Europe. We are fortunate to have Ellen as part of our Wahooligan community of athletes and are proud of her accomplishments both on and off the bike. A: I love how easy it is to train smart on my Kickr. The direct-drive unit means it mimics the feel of riding on the road, which doesn't burn my legs out as quickly as riding a rear-wheel mounted trainer would. It also allows me to set my desired power, which is extremely valuable as I can now complete my intervals and various workouts inside, meaning I can train hard year-round! Q: What is your greatest accomplishment so far? 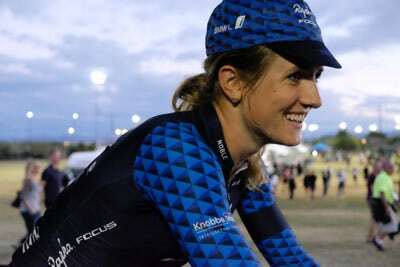 A: I think my greatest accomplishment so far is a tie between becoming 2-time u23 national champion, or winning the Stillwater Criterium at the North Star Gran Prix this summer on the road. Winning Nationals is such an exciting feat because it's the culmination of many years of hard work coming together perfectly on the day. But winning Stillwater was such an exciting win, as I am new to road and it really showed how much my training had paid off. Q: What is your favorite thing about training, least favorite? A: My favorite thing about training is hitting my targets. When my coach tells me to do to x watts on an interval, and I make it happen, but it's a little tough -- that's the best feeling. I know I'm reaching my goals and working hard to make it happen. My least favorite thing about training is getting ready!!! After breakfast, breaking away to get dressed, make sure I have everything, and leaving the house is the worst part. Once I'm out, I'm always happy, but getting ready is for sure my least favorite part. Q: Do you have any good luck charms or pre race rituals? A: I have a lot of good luck charms. I race in a lot of jewelry, each piece signifying people who are important to me. It all began with my favorite good luck charm: a locket, with two photos of my father inside, with always inscribed on the back -- given to me from my grandmother. I also wear an anklet, that both my best friends also wear; a ring from my grandmother; and more recently a bracelet with a bee on it that says "be present" from my boyfriend. I think all of this jewelry holds good-luck energy that helps me race happy! My prerace rituals are pretty extensive, but most importantly I just imagine myself having the best race possible, and repeating positive thoughts to keep me pumped up! Q: How do you use the KICKR Power Trainer? A: I use the Kickr for many types of training. Often times, on easy days, when it's really crappy out, I opt to ride inside since I wont be going hard enough to warm up at all. So, I'll throw my bike on the Kickr, and read my kindle to pass the time. I also love using the KICKR to do intervals. Connecting to the wahoo app means I can work on pedaling hard extremely consistently, and its great to know that I'm hitting my numbers! Having the Kickr this year has helped me nail my workouts all year long!